Three years later, after spending $27 million to construct and equip his shops, Ali found himself in the middle of the infamous Goldenberg scandal. President Moi’s emissaries fabricated documents purporting to export gold and diamonds to World Duty Free. Moi’s emissaries then illicitly funneled the money they received in export compensation to Moi’s re-election campaign. The price of this fraud: estimated at a minimum of $438 million. After World Duty Free claimed it was unwittingly part of the fraud, the government took over the shares and assets of the company to stop Ali from cooperating with the prosecution. When he responded by making statements to the press, he was arrested and then deported to the United Arab Emirates. Ali never recovered his assets, and Kenya never held any officials accountable in connection with the Goldenberg scandal. Although these events occurred more than two decades ago, Kenya continues to fare poorly on Transparency International’s Corruption Index: 139 out of 176. It ranks in the 19th percentile for control of corruption, despite initiatives such as the restoration of the Ethics and Anti-Corruption Commission (EACC). However, some new initiatives are seeking to reinvigorate the fight against corruption. The private sector, led by the Kenya Private Sector Alliance and the Kenya Association of Manufacturers, established the UN Global Compact Network in 2005, which now has 83 companies that voluntarily adhere to the principles, including a commitment not to engage in corruption. In December 2011, Anthony Ragui harnessed the power of social media by launching the site ipaidabribe, which allows individuals to anonymously report instances of bribery. The stories tell of problems that affect both individuals and businesses: off-the-record fees required to obtain construction permits, licenses, electricity, or passports; cash exchanged to keep cars from being towed or to settle petty charges; officials that refuse to sign documents without extra payment. One typical story tells of officials refusing to grant a permit for a company to refurbish its office. The businessman explains, “To cut down on time and to move forward, we chose to pay them off. 6K did the trick.” Each story includes a price tag to document the market price of corruption. Kenya’s current president, Uhuru Kenyatta, has recently decided to employ a similar method to fight corruption. In October, the office of the presidency launched a website that allows users to report corruption directly to the head of state. Citizens can anonymously send video or audio recordings, or other documentary evidence. They can also send complaints via SMS text message. The president’s office then sends reports to the EACC. However effective social media proves to be in reporting corruption, eliminating corruption requires further action to address the reports. Citizens are rightfully skeptical that new cases of corruption will be properly addressed when cases as large as the Goldenberg scandal remain unresolved. Investigations must be launched and prosecutions brought against the demand side of corruption (public officials), rather than focusing solely on the supply side (businesses and individuals). Punishing those who pay bribes while allowing public officials to receive bribes with impunity means that both businessmen like Ali and the public at large will continue to suffer from corruption. Bribery greatly increases companies’ cost of doing business and discourages them from investing in the country. Few businessmen would want to invest almost $30 million to build a company, only to have the government seize all their assets on a whim, leaving them with only a suitcase full of corn to show for their efforts. However, while reporting and investigation can play an important role in anti-corruption efforts, tackling corruption requires reform at an institutional level. In Kenya, CIPE and its partners tried a different approach. The Kenya City Integrity Project does not measure the level of corruption in Kenya. Instead, it looks at measures to prevent corruption and how effectively those measures have been implemented. And it does so at the city, rather than the national, level—the level where most corruption actually takes place. 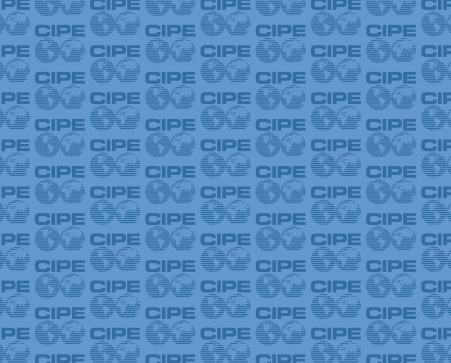 In 2011, CIPE released a report that tried to identify those institutional gaps in Nairobi, Mombasa, and Kisumu. Only by addressing those institutional gaps will the cost of doing business in Kenya decrease. Peako Jenkins is a Public Service Initiative Fellow for the Middle East & North Africa at CIPE. Will Democracy work for Africa’s Largest Economy?